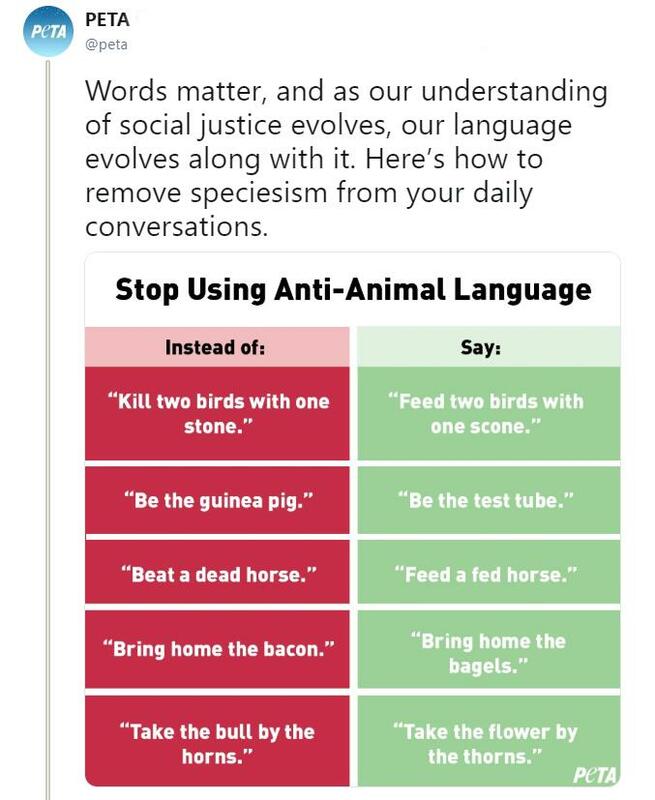 The animal justice group got on the nerves of tons of Twitter users after tweeting out this handy-dandy graphic urging people to alter some common and long-standing idioms with more “animal friendly” versions. The idea is that this kind of conscious change will change our collective cultural mindset to take a more animal-friendly stance and ultimately phase out eating animals and using animal products entirely. So, if you say “bring home the bagels” instead of “bring home the bacon” you’ll want to stop eating fatty, skillet-fried strips of pork fat. They upped the ante by comparing the same “bacon” phrase with using racist or homophobic slurs. By that logic, people who say they “freaking killed it” at work are at a higher risk of becoming murderers or promoting murder in society. If we get rid of this phrase, perhaps murder will become eradicated in the near future? One can only dream. Thank you, PETA, for fighting the good fight. While I can’t speak for everyone, that idea sounds utterly ridiculous to me, and there were tons of other people on Twitter who agree. They were more than happy to serve PETA some high-quality roasts. 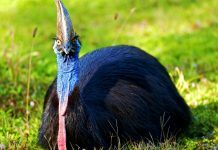 Because of the pedantry on display in PETA’s tweets, people were quick to give them a taste of their own medicine. If the animal rights organization wanted to go all “Um AHCTCHUALLY” online, then they were getting it served right back to them. 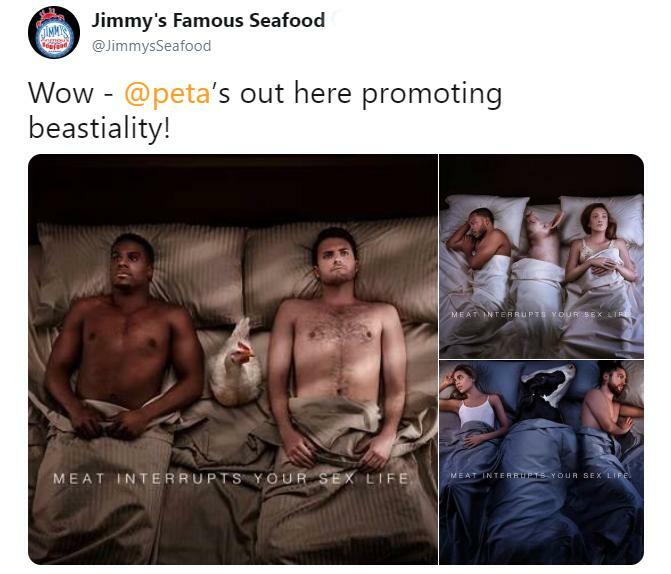 Even though there were tons of people who were more than happy to pile on PETA, Jimmy’s Seafood Restaurant’s response was probably the best. People kept tagging the restaurant online, begging them to respond to the much-maligned tweet. The restaurant finally did, letting their fans know a roast was heading PETA’s way. When crafting an expert mock-tweet, it’s almost always better to clap back at someone using their same wave-length or terminology if you will. Which is exactly what Jimmy’s did when they created some alternative phrases of their own. 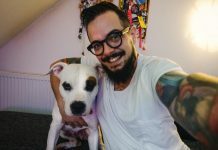 In a final, beautiful touch, they even decided to link to a tragic instance of PETA putting down a beloved family’s pet by accident, a casualty of their extremely aggressive animal euthanasia policies. As glorious as their reply was, it isn’t even the best they’ve come up since their rivalry first began with PETA. On several occasions, the animal rights group would post an ad online, only to be shredded by Jimmy’s for it. 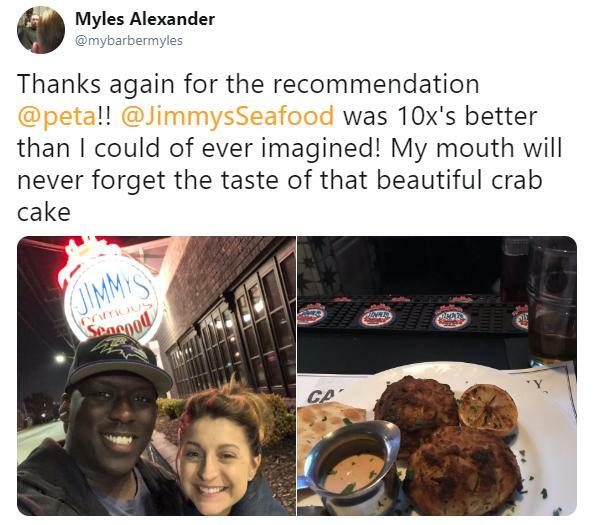 Because of their strong Twitter game, Jimmy’s has also become a huge target for vegan users who don’t like the fact that they’re constantly praising the consumption of animals. Specifically, when they tag PETA in photos of cooked turkeys. 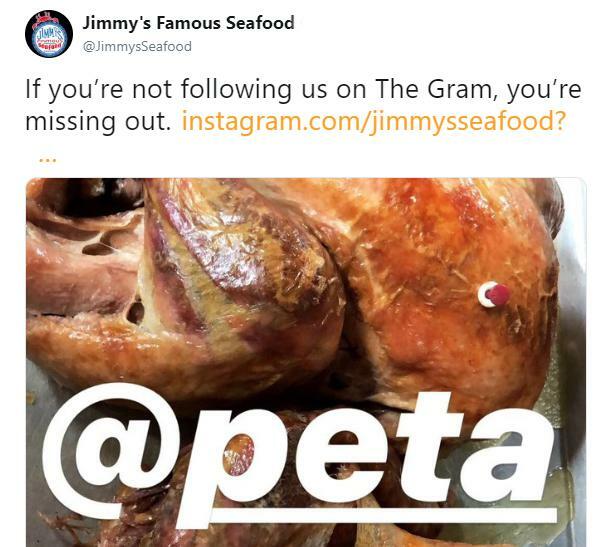 Fans of Jimmy’s are also going out of their way to troll PETA. Like this dude who suggested the original anti-Jimmy’s billboard was an actual advertisement for the local restaurant. I appreciate the fact that they’re willing to diversify their roast portfolio and that it’s not just isolated to PETA — though I do love the way they slaughter their tweets. Keep the social media game strong, Jimmy’s. 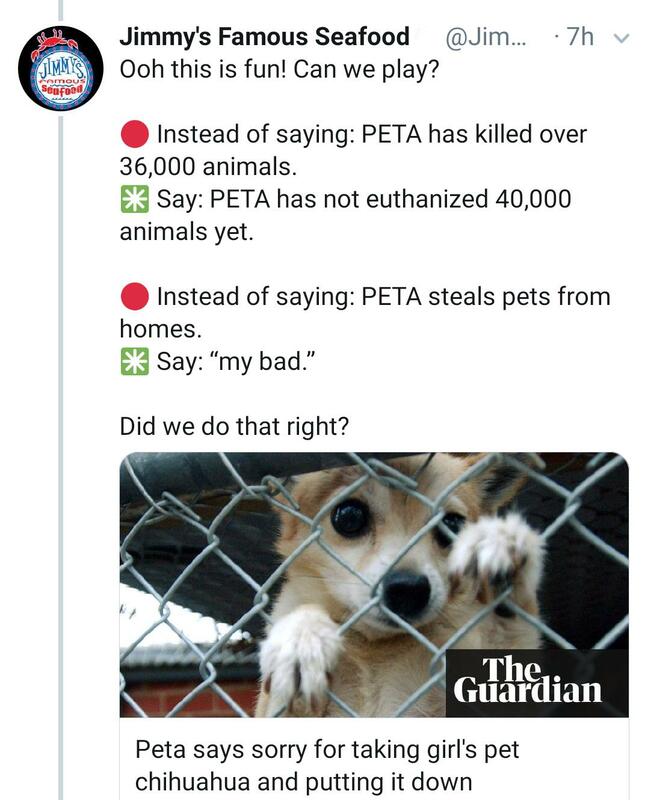 Although honestly, they don’t really need to do much to roast the animal rights group, PETA does a god enough job of making themselves look Christopher-Lloyd-One-Flew-Over-The-Cuckoo’s-Nest-Nuts like when they said you can’t be a feminist if you eat eggs. So bad news for all you women fighting for equality out there. If you enjoy a Denny’s grand slam breakfast, or love you a fine mushroom and spinach quiche on Sunday brunch, you can’t be a feminist. All of your picketing, lobbying, standing up for yourself and your peers at work. All your rejecting of oppressive ideals and social constructs that favor men and rob women of their voices, values, and contributions are now nullified. All because you enjoy a Denver omelette you absolute monster. Shame you on you, and bless PETA for showing us the light.